Garage property insurance is often referred to as casualty insurance and they basically mean the same thing. The coverage generally extends to damage to your property caused by fire, windstorm (tornado), hail and other mayhem brought about by Mother Nature. The insurance coverage does not extend to losses that are an Act of God such as flooding from rain or swollen rivers and tributaries, but often covers flooding from frozen or broken water piping. The difference between losses caused by Mother Nature and an Act of God is the subject matter for an entire book revolving around the psyche of the insurance industry and its principals — and is far more than we can cover here. What you need to know is that an Act of God is never covered by insurance. 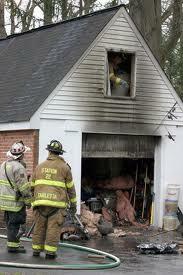 Almost every other type of damage to your garage is. The question is — do you have enough of the right type of insurance coverage for the current state of your garage. If you have a Hot Rod Laboratory or Man Cave replete with all the trappings and fixings, you probably are under-insured. If your garage is also a woodworking shop, you may be surprised at the value of all of the tools and equipment you have accumulated over the years and what it would cost to replace them today. Generally, most property coverage will insure the contents for a percentage amount of the insurance coverage on the building, that the contents sit within. There are a lot of owners who have more value, cost-wise in their contents, than the building itself is worth, leaving them grossly under-insured on their contents. This often happens with garages and workshops. We recommend that you do the inventory described on our Garage Insurance page and then audit your current insurance coverage to find out where you stand. You may be one of the owners that is grossly under-insured for your contents, but just fine on the building itself. Your insurance agent can supply specialty insurance coverage for just the over-value of the contents to keep you protected. Also, read our page on Garage Liability Insurance while you are looking into garage property insurance. You may find that you fall into the categories described that are a looming financial disaster for you and your family. Keep yourself protected by keeping yourself knowledgeable.